newsThe National Broadband Network Company has blocked a freedom of information request which would have seen information released about the amount which it will cost Australians outside the company’s planned fibre broadband footprint extended to reach their premises, in a move first reported by iTNews. NBN Co’s fibre optic network footprint is planned to cover 93% of the country’s population. This his has led to some discord among the remaining 7%, especially when some of those are right on the border of the fibre rollout zones. These users are expected to be served by satellite and wireless technologies, both of which have lesser capacity than fibre. NBN Co does have an option for residents on the edge of the network footprint. These customers can pay the charges for extending the cable. 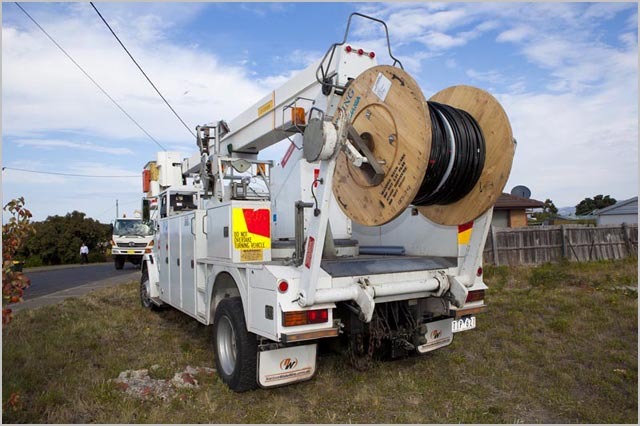 This offer came about mainly because residents in Tasmania, in some of the early stage rollout zones were unhappy about ‘just missing’ the fibre connection. People who wished to have the fibre extended to their homes lying beyond the footprint were asked to call the company before 24 June, 2011 and request a no-obligation quote. The company would then determine how much each extension would cost. NBN Co also made it clear that it wouldn’t be a single number stating the cost of extension as this would have to vary depending on factors such as distance in kilometres from the actual footprint. However, it appears that NBN Co is not too keen on revealing these costs to the general public, with recipients of the extended connection signing non-disclosure agreements, and hence being unable to reveal how much the extended connections cost. In a response published last week (PDF) to a request by technology media outlet iTNews under Freedom of Information laws for NBN Co to reveal the price paid, NBN Co said that it couldn’t reveal the price, as this could snowball and lead to serious problems for the company. In a statement emailed to Delimiter responding to the FoI issue, NBN Co said that it had “appropriately assessed the FoI request” within the terms of existing legislation and “its role as a commercial entity operating within a highly competitive market”. It seems obvious why NBN Co doesn’t want to provide the fibre extension costs publicly. It is likely the case that the company doesn’t want to kick off yet another round of media speculation and debate about the cost of the network it’s building. If the fibre extension costs were disclosed, I’m sure many edge case Australians who were just to miss out on the fibre would come forward, demanding that the costs be waived or at least cut down. However, NBN Co’s action here also highlights a lack of transparency. The costs of its fibre extension activities will be released eventually anyway, one way or the other. It makes no sense for the company to hide them. Those costs should be released public and become part of the public debate about the NBN. I suspect I live just outside the fibre footprint (semi rural acre+ development outside of a regional city). Knowing the approx likely cost of the fibre extension would greatly assist me in deciding whether to sell my property now, and move to a new NBN Greenfields estate, or wait it out and pay for the fibre extension. Given the costs of selling and buying/building again (agents fees, stamp duties etc) are likely to total in the 10’s of thousands of dead money, I have a fair budget to spend on fibre extension, but the lack of transparency means I have no figures to use in making my decision. Why dont you contact NBN Co and ask them. You have made an assumption that you will not be connected in the first place and now are planning for extra costs of something you may or may not need to pay for. Unless you live near a first release site you will not have to worry about this for at least a year or longer and by that time it will be public knowlege. I have contacted NBNCo some months ago and they told me to request a fibre extension quote once my region is included in the fibre rollout schedule. I’m not too concerned. These costs are going to be different for everyone. If you live in an area where NBNCo can easily dig/lay cables, it is going to cost a-lot less than an area where there are access issues etc for the same distance travelled. In some cases I don’t doubt the costs will be astronomical, in others these costs are going to be easily affordable. But, media scrutiny during the initial roll-out test phase over prices when taken out of context will only harm the NBN, harm potential customers access to the NBN, is not going to help anyone. Here’s an example. Punter A is in a really hard to access location (that isn’t immediately obvious WHY it is hard to access), and gets a quote of 10 thousand dollars during the trial roll-out period, goes to the media and the media do a beat-up about how the government is charging people 10 thousand dollars if they want the NBN and they are outside the fibre footprint. Punter B in an easy to access location, hears that price on TV and when the time comes to submit the application, doesn’t bother, thinking it will be in excess of 10 thousand dollars. I really don’t see how Punter B is helped by Punter A’s experience. And even if there is a Punter C during the trial rollout, who gets a quote of 2 thousand dollars to join the network, he isn’t going to go to the media and/or (more likely) the media won’t show his story because there is no “scandal”. Lets wait until their extension plans are finalized, before we start analyzing how much those plans cost. I suspect NBNCo haven’t decided how they are going to handle these extensions in the long term, and are trialing different methods (ie who to quote and who to ultimately pay to do the connection).